YouTube have been busy adding a set of new features that include a higher 60 frame per second option, along with a crowd source funding option and a new Creator Studio app. The faster frame rate option which will offer between 48 & 60fps will be rolling out over the coming months, but there are already some posted as we speak. Video gameplay videos. will benefit from the extra action and smoother speed that faster frames will offer. To watch these viewers will need to turn on the HD option. The YouTube Creator Studio app will let video creators see stats and manage videos whilst on the move. Available on Android devices now and coming to iOS soon. 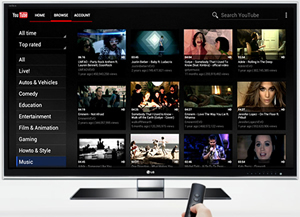 Other features added by YouTube include the addition of thousands of free to use sound effects to the Audio Library, as well as the interesting sounding fan-created subtitles. 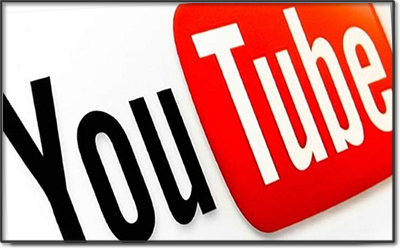 The news follows the announcement that Youtube will be offering a music streaming service to consumers, who can choose to watching unlimited music videos either free and ad supported, or pay a monthly fee to watch them ad free and with offline options. Now that the technologies are here for just about anyone to start streaming video content online, many local venues have become quite popular and this is why we look at the question of how to make money with streaming video online. Combining even the most basic cameras and lighting and sets, a local person can shine in the spotlight and in many cases become quite well off at it. 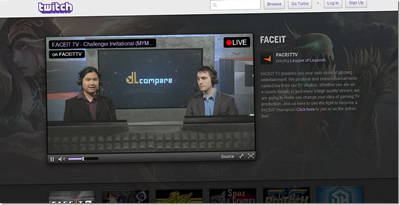 There are group streaming sites like Twitch.tv where people actually broadcast their own shows. Most are of people playing video games. One such show that gained popularity was Man vs Game where a fellow would play video games online and review them during gameplay. His enthusiasm and funny commentary ushered in a new wave of copy cats but none actually matched up to him. His success led to him earning good money and expanding his reach in the gaming industry. Other shows feature cooking, fishing, pets, science, paranormal, sports commentary, and more. One can literally broadcast from home, from one’s living room and with ad revenue and a fan base can make a lucrative living. You have to be interesting and entertaining and have more than the average but it’s possible and is done everyday. It’s a matter of math. A person with a streaming broadcast might have 10,000 fans. Those fans come in daily or weekly and click ads or subscribe. They might buy merchandise as they form their fan clubs. Churches and other non profits can produce entertaining content and get their parishioners to share that info and contribute via donations or subscriptions or even merchandise. You don’t need a million viewers, just enough loyal viewers to bring in consistent revenue and attention. With today’s social networking it can spread like wildfire. It’s not difficult to broadcast as some of the software is free. If your content is good other streaming sites may ask you to join them and they’ll pay you. Funny and entertaining and educational always win out here. So with the average desk top, laptop, tablet, and even smartphone can turn into a broadcasting center with just a camera, microphone, and free or purchased software. Give it a try and broadcast to your family and friends and see how they like your skills. You might end up surprised. 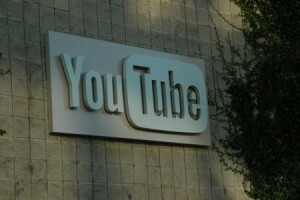 With Netflix hot on its heels YouTube is still the largest of video and social media websites. It’s for good reason to. YouTube is like a global television site where you can peer into the past, present, and future. Think of it. YouTube is where you can go and see videos from all over the planet featuring people doing the funniest, cutest, most horrific, gross, fantastic things on video ever imagined. There appears to be no end to the content that is being uploaded to YouTube every day and night. The most helpful videos are the tutorials. People find these tutorials and help tips of invaluable measure. From fixing a clogged sink to housebreaking a pet, YouTube will have multiple videos from experts to amateurs. This saves tons of money to the average consumer. The pet tips and tutorials have helped who knows how many people care for their animals and not have to spend a lot to do so. The archives of those long missing movies and videos from talk shows to concerts pop up on YouTube and old and new generations can enjoy them as well. Late breaking news videos that the networks don’t have appear as well and many have been used in broadcasts and court trials. With the proliferation of cameras around the world there is no place that can’t be videoed it seems. People who capture an event from another angle like a tackle at a football game or some fight in the streets can be the difference between many a decision of importance. Corrupt police live in terror that their brutality or unethical behavior will appear on YouTube for the whole world to see. It’s a pins and needles world nowadays for the bad guys. This is why YouTube outdistances both Netflix and Facebook. Social networking with video. A combination that can’t be beat. UK TV broadcaster, Channel 4 have removed all full length TV shows from Youtube and are only leaving short form content on the video sharing website. 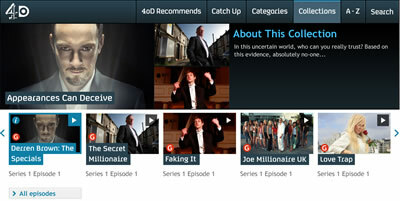 For the last few years, viewers in the UK could find a number of Channel 4 catch-up shows from the 4oD platform on YouTube as part of a long running agreement. Although viewers can still watch clips on Youtube of hit shows like Misfits and the Inbetweeners, all full length shows including those from More4 and E4, are gone as well. So it looks like they want viewers to watch catch-up using a Channel 4 app or website such as 4oD, which are now available for most phones, tablets as well as smart TV’s, Sky and Youview platforms as well. Plus it means they wont need to share any advertising revenue. Channel 4 are following the lead of other UK catch-up services like iPlayer and ITV Player have a presence on Youtube, but do not offer full content. Watching video streamed from the web has hit a new milestone say Comscore. 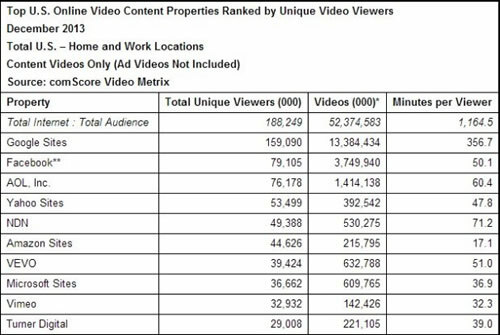 They have released the Video Metrix rankings for December 2013, and in the U.S. viewers watched a record 52.4 billion videos, the first time it has ever passed 50 billion. The number of people watching online streaming hit 188.2 million, and the number one site (as ever) was YouTube which had 159.1 million unique viewers, a rise of 4% on the year. The big winners from a year ago were Facebook in second place with 79.1 million unique viewers, a growth of 47% from a year ago. Next came AOL who’s viewer numbers rose 48% to 76.1 million in December compared to the same period in the previous year. Next came Yahoo with 53.5 million unique video viewers, a rise of 2.2% from December 2012. To pay for all that free streaming, 35.2 billion ads were viewed for a total of 13.2 billion minutes in December, which is also a record number. In the middle of their well-publicised ‘comedy week’ and current 8th-birthday celebrations, video-sharing giants YouTube have revealed to what extent they actually increase in strength by with each passing moment, as an average of ‘100 hours of video’ are claimed to be uploaded to the site each minute, according to the latest figures of owners Google. The statistics add to the news that the site recently broke 1 billion unique monthly visitors, and offers a glimpse at just how much more content gets poured into the site than is actually viewable (in order to keep on top of everything uploaded as it happened, YouTube would require a team of at least 6,000 people looking non-stop at new videos). The figures also mean that on average, 2,400 hours of new video content are uploaded to YouTube by the hour, while 57,600 and 21,024,000 hours are uploaded daily and annually, respectively. Or from a different perspective, every passing second sees 100 more minutes (longer than many feature-length films) of video content added.